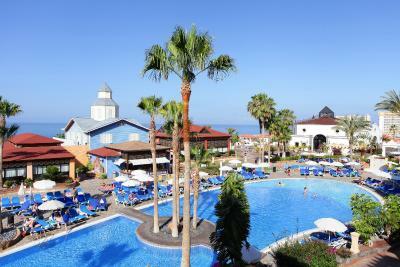 Lock in a great price for Sunlight Bahia Principe Tenerife – rated 8.3 by recent guests! Brilliant hotel ,large territory, perfect for all ages, families, couples, retired people. Lots of different zones with children and without children, so if you need some privacy you can find yourself in few isolated zones. For families with kids lots of activities, heated swimming pool, playground, kids club, zone for kids with bouncy castles (need to pay extra) , baby disco, slides , by the pool and in a village that is part of the hotel. Even with lots of people and kids feels very quiet and relaxed. All very thought through for your perfect holiday have shops, pharmacy, restaurant , bars, music for adults and kids separately. Beautiful large and green territory.Massive beds and large rooms. Nothing to complaint about all was great from choice of food to rest and entertainment. Would definitely recommend as one of the best options in Tenerife. Clean, beautiful grounds, nice pool areas, family friendly. Quiet area, but easy to get a cab anywhere. Nice views, courteous staff. The food selection was great and the grounds were beautiful! This hotel was amazing, I loved it all. The location was ideal, away from the maddening crowd of hotels in the centre of Adje. I would highly recommend this hotel without a doubt. Huge variety of different food: Meat and Fish, various Sushi and desserts! Food buffet was the highlight. Always very good with great selection. 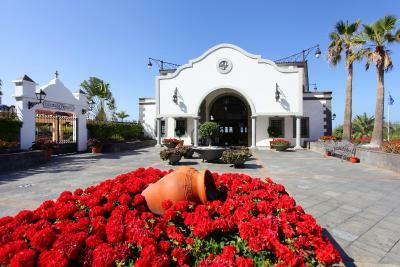 Fantastic hotel in a great location by the sea. One of the most beautiful hotels in area. The all-in catering was excellent. The reception staff at Sunlight Bahia Tenerife were absolutely fantastic in getting us the rooms at this hotel due to the mess up with Booking.com. The location, clean everywhere in hotel, the building Waauw ! Friendly hardworking staf ! The only minus was the tour with bus we booked un at hotel ! 10 hrs on bus and out bus 2 x 20 min and once 90 minutes x we complained but no money back 😆we could laugh with iT after x suuuuper hotel , was second time we went!!! The room was nice, service and staff very friendly. It is a perfect location and resort if you want to relax you have everything you need. The Brazilian restaurant is really good! Multiple pools, activities. Sunlight Bahia Principe Tenerife This rating is a reflection of how the property compares to the industry standard when it comes to price, facilities and services available. It's based on a self-evaluation by the property. Use this rating to help choose your stay! One of our top picks in Adeje.Featuring outdoor pools, sun terraces and on-site restaurants, Bahia Principe Tenerife is set on the Costa Adeje coast, 10 minutes’ drive from Adeje town and Costa Adeje Golf Club. 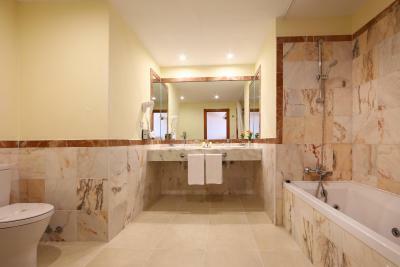 The property includes an on-site gym, tennis courts, spa and children’s playground. You will also find entertainment options such as karaoke. Air-conditioned rooms come with a private balcony and TV. They each have a private bathroom with a hairdryer. 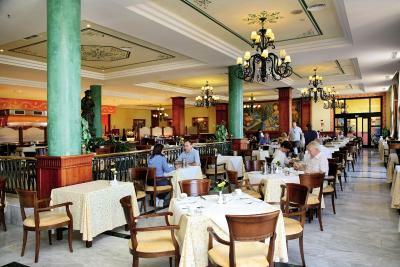 Playa de las Americas is a 20-minute drive away, and there you will find a range of shops and dining options. Tenerife Sur Airport can also be reached in 20 minutes’ drive. 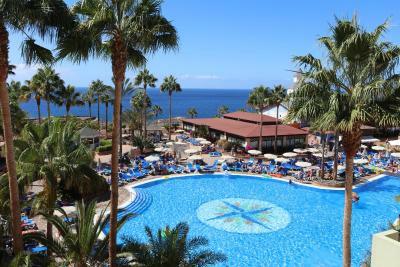 When would you like to stay at Sunlight Bahia Principe Tenerife? 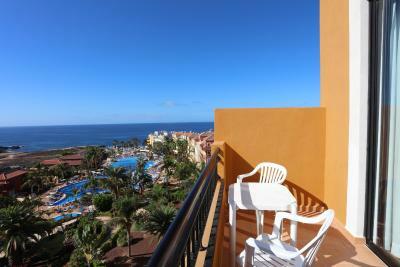 This single room has a balcony, sea view and air conditioning. This suite has a balcony, air conditioning and sea view. This suite has a balcony, air conditioning and sea views. You'll love it because... • Because of the activities and facilities for the whole family: sports, shows, children's areas and much more. 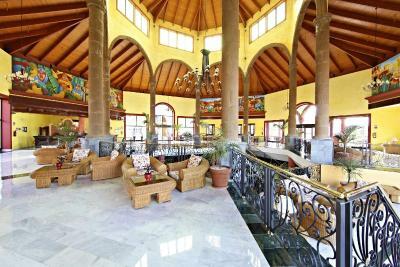 • For the relaxation you'll enjoy and your proximity to paradisiacal beaches. 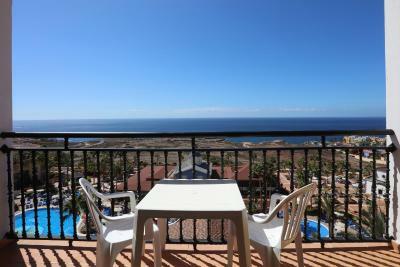 • For the amazing views of the Atlantic and La Gomera Island from high up on the cliffs. 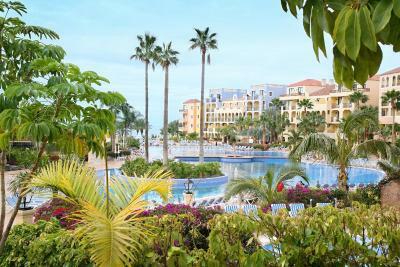 House Rules Sunlight Bahia Principe Tenerife takes special requests – add in the next step! Sunlight Bahia Principe Tenerife accepts these cards and reserves the right to temporarily hold an amount prior to arrival. 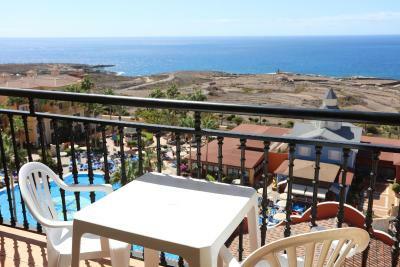 Please note that guests staying in Junior Suites should check in at the Tenerife reception. 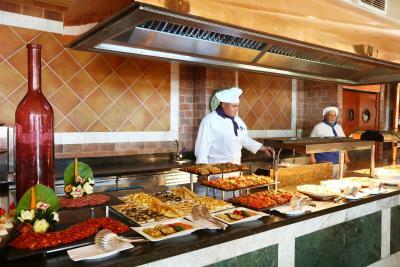 All other guests should check in at the Costa Adeje reception. 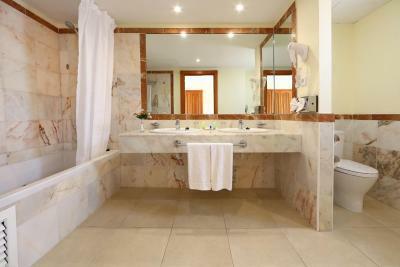 Guests will be allocated in different buildings of the resort upon availability. Please note that children under 2 years old are considered as babies. Please note that children over 12 years old are considered as adults. we enjoyed the delicios food and the pool area! They could have some mats for the pool for children to run across and more pool activities for older children and adults could join in too,other hotels we have stayed have had foam activities in there tennis courts need to look at what other hotels are doing for all the family not just little ones. The staff were lovely an excellent hotel. Waking up early to reserve seats by the pool. My only irritations were the - at times - very loud music for evening entertainment and the waiting staff in the restaurant at evening service, who clearly need to run so fast that it makes them quite grumpy. When we booked with Booking.com the hotel we were meant to stay in had changed with no notification and didn't find out until we arrived. On arrival at Bahia Principe Tenerife where we thought we were staying at, we were told we were staying at their sister hotel down the road. 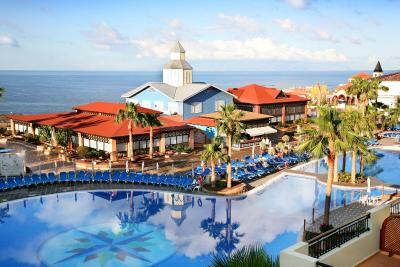 The Confirmation email we received also stated were were staying at Bahia Principe Tenerife. We choose this hotel because 5 friends were staying there and we were going to surprise them, also this was our 8th visit. Thanks to the reception staff at Bahia Principe Tenerife we were eventually able to stay at the hotel we booked for. 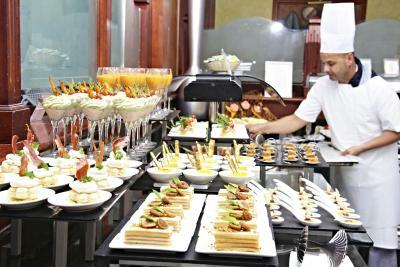 Buffet food was very tasteless, made of cheap ingredients. Very oily and deep fried. I find a dead cockroach at the restaurant washroom. Bad quality beverages (alcohol), the juices was mixed with water, burned taste of coffee. Provision of soya milk and microwave. It is a bit far from the towns you are stuck at the resort. But if you have a car, no problems. Entertainment provided by the 'Animation Team' was very poor and sometimes inappropriate for the young children who were there. Food was far too salty and had no flavour - sometimes we couldn't tell what we were eating! Hot food wasn't kept hot. The wine wasn't of good quality. The 'sea view' was very limited from our room. The very spacious balcony was not much use to us as the sun did not reach it.